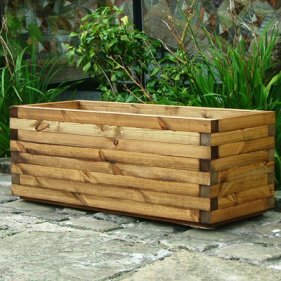 The Oblong Wooden Garden Trough Planters are deep, and long planters that are both stylish and practical. The Oblong is made from lengths of 4.5cm x 4.5cm Scandinavian Red Pine which are joined and glued. The planter is then treated with a high quality, plant friendly water repellent preservative. Te internal walls of these planters are now painted with a waterproof paint sealant. Strawberries can be grown in all sorts of planters. To enjoy fresh berries over the longest period, either grow perpetual fruiting varieties, which allow you to pick small quantities of fruit all summer long, or plant early, mid season and late varieties separately. This method allows you to harvest more fruit at any one time, but takes up more space. The best way to start is to buy pot-grown strawberry plants in spring: ten strawberry plants are about right for one of our 45cm square planters. Plant them immediately in soil-based compost and they will produce a modest crop in their first year. The second season should see a bumper crop, followed by a slightly lower yield the third summer. compost dry out, particularly when the fruit is forming and ripening; if you do, the bulk of your crop will drop off the bush almost immediately. bushes and redcurrant bushes will also thrive for many years in large planters. And rhubarb is another great, if unexpected, plant for a planter, with its wonderful architectural foliage. If you have room in the planter around the fruit bush, you could add almost any decorative bedding plants the effect will be spectacular. Most soft fruit thrives best in a soil-based compost: John Innes No.2 for strawberries, and John Innes No.3 for red, white, blackcurrants and for gooseberries. A rhubarb crown needs a good-sized planter 60cm square. The stems can be pulled until early July: then it should be allowed to grow unchecked to build up reserves. All soft-fruit bushes need to be watered copiously and fed regularly with a liquid tomato fertiliser, starting when the fruit begins to form continuing until it is gathered.